A report released from the European Commission revealed that EU green jobs in 2010 totalled 1,440,000, an increase of 25 percent from 2009. Leading the way in renewable energy jobs was the biomass sector, which accounted for 273,000 jobs. Solar photovoltaics (PV) and wind power came in second and third place, with 268,110 and 263,145 jobs respectively. Germany, Italy, and France led the way in PV job growth, with PV jobs expanding by 70% in 2010. However, PV growth could achieve high levels in other parts of the EU, as solar energy becomes an increasingly cost effective alternative to fossil fuels. Many reports even suggest that solar power could achieve grid parity before 2020. 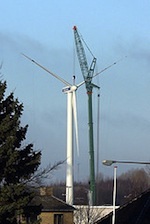 Analysts suggest that many factors contributed to job growth in the EU green sector. For instance, a particularly long and severe winter boosted household consumption of heat, which spurred growth in renewable energy-source primary consumption. Higher rainfall led to higher hydroelectricity output. Finally, structural changes played a key role in increasing renewable energy consumption, facilitated by extended power grids, renewable energy programs, and industry investment in green power. Probably the biggest take-away from the report, however, is that renewable energy is becoming an increasingly important component of job growth. Countries that have solid environmental policies and carbon pricing initiatives are able to create jobs in the emerging green economy. Although the EU has achieved a 1 million green job milestone, many more jobs are sure to come. How do you view Europe’s green job numbers? How big of a contribution do you think green jobs will provide for the EU economy in the future?